These doctors from Mumbra — Dr Abdul Mohid Siddiqui and Dr Imran Siddiqui — had issued such certificates for ten people who are still alive and three others who are dead, sources said. 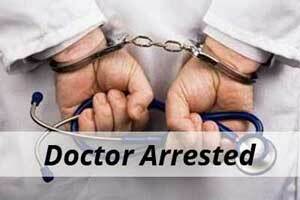 Thane: With the arrest of six people including two practising doctors from Mumbra town of the district, the Local Crime Branch on Sunday claimed to have busted a major racket in claiming insurance sum based on alleged fabricated and false death certificates. An offence under sections 420, 465, 467, 468, 471 read with 34 of Indian Penal Code had been registered at the Vitthalwadi police station in relation to the fake insurance claims and cheating of the insurance companies to the tune of lakhs of rupees, police said. During the course of the investigation, police got a breakthrough with the arrest of the main accused, Chandrakant Narasimulu Shinde of Kalyan. Through Shinde, police reached an employee at the civic crematorium in Mumbra, Tejpal Ramveer Mehrol, who managed to get fabricated death certificates for claiming the insurance sum from two doctors — one of whom was an MBBS from Mumbra. Mehrol got Rs 15,000 for each of the false death certificates while the doctors were paid only Rs 2,000 for each of the certificates. Two others arrested are the relatives of Shinde, whose names were given as Laxmi Narayan Shinde and her husband Narayan, the nominee. The main accused had already obtained Rs 81 lakh by lodging such claims with the cooked up and fabricated documents and also had lodged claims for additional Rs 55 lakh, but he was caught before the things materialised. He had lodged claims with Bajaj Alliance Life Insurance and Aditya Birla Sun Life Insurance companies. Police are now trying to find out if any of the employees of the Health Department of Thane Municipal Corporation (TMC), which issues the certificates and also employees of the insurance companies, were part of this mega racket. The Crime Branch of the Kalyan Police are now carrying out the further probe into the racket in order to find out the extent of the racket, the money involved in the same and the beneficiaries, sources added.